Species at risk are plants and animals that are in danger of disappearing from the wild. 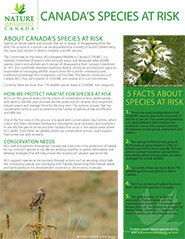 There are more than 300 animal and plant species considered “at risk” in Canada. The survival of a species can be jeopardized by a variety of factors, and determining the cause and solution is often a complex scientific process. Who determines which species are at risk? The Committee on the Status of Endangered Wildlife in Canada (COSEWIC) is a national committee of experts who assess and designate what wildlife species (plants, animals and insects) are in danger of disappearing from Canada. Established in 1977, this committee is composed of members representing federal, provincial and territorial agencies responsible for managing wildlife, experts from the scientific community and specialists in community and Aboriginal traditional knowledge. The Nature Conservancy of Canada (NCC) has participated actively in the process, with NCC's vice-president of conservation Michael Bradstreet sitting on the panel as a non-government science expert for the last 10 years. 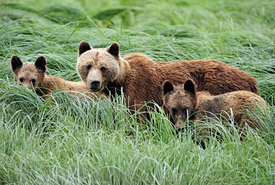 A recovery strategy is a document that outlines the long-term goals and short-term objectives for recovering a species at risk, based on the best-available scientific information. A recovery team is a group of individuals working together to develop a recovery strategy for an endangered or threatened species. Recovery teams include members of the community, academic institutions, government departments, parks, museums, non-government organizations and other conservation organizations that volunteer their time to oversee recovery and conservation planning and efforts for species at risk. The habitat that is necessary for the survival or recovery of a listed wildlife species and that is identified as the species critical habitat in the recovery strategy or in an action plan for the species. What laws are in place to protect species at risk? Species at risk, and the habitat they need to survive, receive protection from several federal, provincial and territorial laws. The key piece of federal legislation that protects species at risk is the Species at Risk Act (SARA). SARA aims to meet Canada's commitment under the Convention on International Biological Diversity. The goal of the Act is to protect species that are at risk of becoming extinct. Under the SARA, the Government of Canada takes the recommendations made by COSEWIC into consideration when establishing which species will be listed under the Act. What are the different levels of risk? Extinct - a species that no longer exists anywhere on Earth. Extirpated - a species that no longer exists in the wild in Canada, but is still living in other areas of the world. Endangered - a species that is facing imminent extirpation or extinction. Threatened - a species that is likely to become endangered if nothing is done to reverse the factors leading to its extirpation or extinction. Special concern - a species that may become threatened or endangered because of a combination of biological characteristics and identified threats. Data deficient - a category that applies when there is not enough available information to determine if the species is at risk or not. Not at risk - a species that is not at risk of extinction. What is NCC doing to protect species at risk? Throughout Canada, NCC staff and partners are playing a key role in the protection of habitat for Canada’s species at risk. Together, they are working to gather the clues and develop strategies that will help ensure the identification, protection or even reintroduction of Canada’s species at risk. 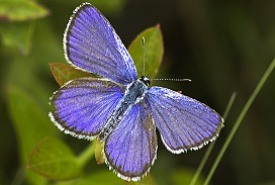 NCC participates in important work that contributes to these species’ well-being, through on-the-ground actions, such as monitoring species and improving their habitat, by researching and planning what habitat needs to be conserved for species or by participating in the development of species-at-risk recovery strategies. In fact, in the last five years (2007-2012), thanks to funding through the Government of Canada’s Natural Areas Conservation Program, NCC has helped to protect habitat for 117 species at risk across the country. You too can help ensure these species continue to thrive, by supporting our conservation and stewardship work.